Yes, yes, and no. We were in a hurry to get back, so we can check the contents now. Nope, time to find out. >You said, calming your breath and just having a rest. Satisfying your thirst helped much. 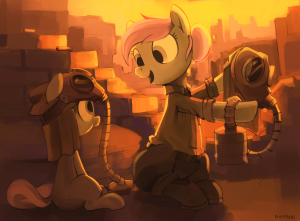 "Time to find out what that fellow had on himself"
>Everypony who could gathered around to see what may be inside vest's pouches that you decided to examine first. >Hran reminded you about his presence by low moan followed by "I want to see too! ", so you turned towards the couch. Cushions put Kalina on your bed. >Watches. Personal watches of all colours and sizes. >Searching backpack revealed spare underwear and kind of brimless cap, balaclava, simple sewing set, pack of crackers, canned meat and two bottles of water. >Another water canteen was attached to rucksack's side. >All three ponies were somewhat disturbed by meat-containing tins, collective decision was to put them away for now. >You still had much of the day. It took me so long this time because I tried to draw that symbol. Several times.